Benimaru is a member of the KOF "Hero Team" and one of the original protagonists of the King of Fighters series. He is born of half-Japanese and American descent, and wears a waist-length sleeveless top with matching jeans/pants. 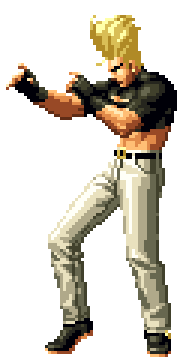 Benimaru Nikaido (二階堂 紅丸) debuted as one of the members of the "Japan Team" in The King of Fighters '94 (also composed with Kyo Kusanagi and Goro Daimon). This Team was renamed "Hero Team" the next year and kept that name through the whole Orochi Saga. Benimaru, while sometimes outspoken and flamboyant, means business in battle since he's very proud of his skills and doesn't want anyone to look down on him for his good looks. He also likes to say English quotes upon winning a battle. He also respects ladies, as shown with a special introduction pose before engaging in battle with a female opponent. Even though he tends to be more than a flighty flirt, when it comes to certain things (along with seeming as if he has an indecisive mind), Benimaru in fact has a heart of gold, his loyalty and respect can go a long way and even behind the American exterior he still holds close the Japanese personality traits. His fighting technique specializes in shooting techniques and electricity. This page was last edited on 14 March 2018, at 02:11.